In 2006, Warner Auditorium, which housed the Church of God Convention (“camp meeting”) since the early 1960s, came down. Asbestos had claimed the structure, deeming the “the dome” unsafe for occupancy. But before the dome, there was the “old tabernacle.” This iconic structure, too, met an untimely demise after a snowstorm claimed it. In recent years, the site has remained empty and relatively lifeless. 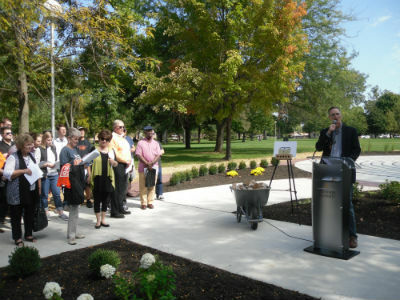 But Anderson University has recently given new life to the plot of land, reclaiming and rededicating those holy grounds for prayer. Can you imagine how many prayers have been offered up over the years at the sites of the old tabernacle and Warner Auditorium? Or how many people have given their lives to Christ, been healed, accepted calls to ministry and missions, and been changed forever? Now pause to imagine how many more prayers will be offered up and lives touched by the Lord through Anderson University’s latest resource for prayer. And give thanks. Rooms, corners, and gardens dedicated to prayer already exist on the campus of AU, but a new place for prayer has been constructed at the site of Warner Auditorium—connecting not only the school’s Christ-centered history, but the rich heritage of the Church of God movement. “For those of you who grew up coming to Camp Meeting, spending time in Warner Auditorium, this is our way of memorializing this space, this holy ground, in the Church of God,” John Pistole, AU president, explains. Warner Auditorium bricks at the site of the future informational display. Celebrating fifty years, Anderson University constructed and lit their eternal flame. After seventy-five years, the institution unveiled the sculpture known as Helios, a “metaphor for the searching, illuminating, ever-growing phenomenon that we call a university.” This year at homecoming, following the school’s 100th anniversary year in which the idea took root, AU dedicated its centennial prayer labyrinth. 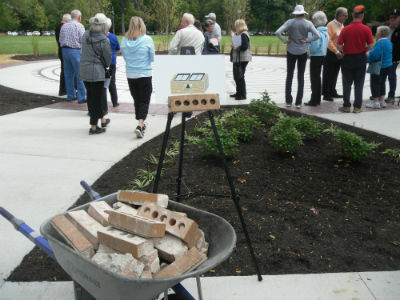 At the entrance to the labyrinth, an informational display will be constructed with the bricks of Warner Auditorium, further giving tribute to the facility where Christ was exalted and countless Christians were discipled. A brief history of the sacred grounds is expected to be included, as is a brief history and explanation of the ancient Christian practice of using labyrinths as a resource for prayer. Preserving even more of the heritage of the site, the original bell will also be included in the display. Prayer labyrinths look like a maze, but aren’t intended to confuse users or render them lost. Those who enter walk through at a relaxed pace, encouraged to slow down from the hurried pace of life and simply dialogue with the Lord. Symbolizing the journey of life, moving toward the center of the prayer labyrinth encourages the believer to listen to the Spirit, meditate on what He is saying, and move back out of the labyrinth renewed and equipped to bring the hope of the gospel into the world. 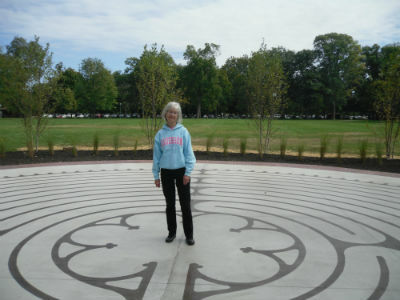 Connie Hippensteel in the center of the prayer labyrinth. To learn more about Anderson University, visit www.anderson.edu. To learn more about the Church of God, visit www.JesusIsTheSubject.org. This entry was posted in All Church of God, Colleges & Universities and tagged Anderson University, AU, Centennial, CHOG history, Church of God heritage, Connie Hippensteel, Jason Varner, John Pistole, prayer, prayer labyrinth, spiritual disciplines, Tamara Shelton, Warner Auditorium. Bookmark the permalink.